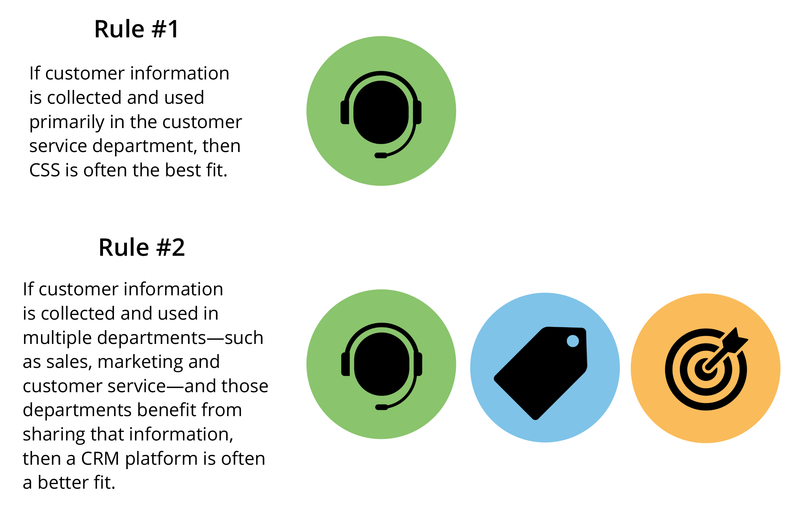 Customer Service or CRM Software: Which Do You Need? This is a good question—and one we frequently help answer. At Software Advice, we assist small and midsize businesses (SMBs) in a wide variety of industries, as they focus their search for CRM and customer service platforms. Choose a broader CRM suite that includes CSS among its (often many) other applications. Live chat Allows customer service representatives (CSRs) to chat with customers online and automatically capture key content from chats in the ticketing system. Many customers prefer to interact by chat instead of phone. Customer self service Offers a web-based customer portal where customers can search for answers to common problems. This can take the form of documentation, searchable FAQs, how-to pages and more. If the customer can’t find an answer, web self-service tools allow them to submit a ticket online or start a live chat. Knowledge management Maintains a database of descriptions to common or previously resolved problems. These resources might be available publicly via a self-service website, or reserved for internal use by CSRs. Multi-channel management Manages customer interactions received through multiple channels, including phone, web, email, live chat, mobile app, Facebook, Twitter and others. All interactions are stored and routed to appropriate agents for resolution. Analytics and reporting Enables managers to create custom reports that provide insight on team performance, time to resolution, customer satisfaction and other key indicators. This table is discussed in more detail in our CSS Buyer’s Guide. Not all CRM platforms include a CSS application, though many do. They also include a range of applications to help make better use of customer data, automate some aspects of marketing and sales and facilitate the sharing of customer information across a company’s departments. Marketing integration Lead management (including tools for lead generation, scoring and nurturing), email and event marketing, landing pages, web and marketing analytics tools and campaign management. Sales force automation Contact and opportunity management, workflow automation, territory management, sales forecasting, pipeline analysis and reporting. Customer service and support Trouble ticketing, knowledge management and knowledge base systems, self-service solutions, case management, live chat and surveys. Field service management Dispatching, scheduling, invoicing, inventory management and order management. Call center automation Call routing, recording and monitoring, load balancing, call list management, auto dialing, scripting, computer telephony integration (CTI) and interactive voice response (IVR). Help desk automation Trouble ticketing, knowledge management, self-service, IT asset management, network management, service level agreement (SLA) management and remote control. Channel management Lead and contact management, partner portals, partner relationship management and market development funds management. This table is discussed in more detail in our CRM Buyer’s Guide. 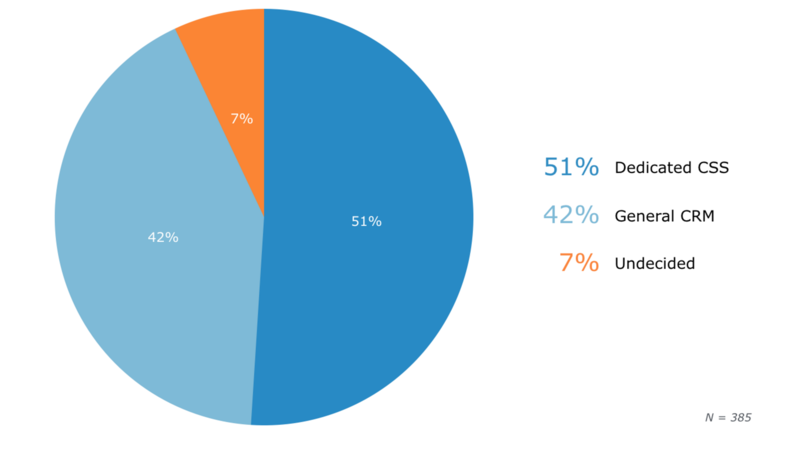 In 2015 we analyzed a random selection of 385 interactions we had with CSS buyers. We found a very even split between those opting for dedicated CSS solutions versus those wanting CSS as part of a broader CRM platform. Deeper analysis of this data did not support any further generalizations. Even when segmented by company size, industry or annual revenue, this even division remains. Knowing this may not help with your own decision, but it supports the notion that taking your time on this decision will be time well-spent: There’s no clearly superior choice that works for all businesses. There are however some fundamental factors you can consider, and doing so will help you better define the type of platform you require. Now is a good time to remind readers: Purchasing software with more functionality than needed can be a detriment to productivity. Software with “all the bells and whistles” often introduces unnecessary steps into an employee’s workflow, killing their efficiency and harming the customer’s experience. It’s best to choose software that matches and supports existing workflows, without creating excess complexity. Instructions: Use the dropdown menus to select either TRUE or FALSE, depending on how accurately each statement describes your company. The blue bar at the bottom will update and indicate a general recommendation for pure CSS software versus a CRM suite. *If you’d prefer more personalized assistance, call us at (855) 998-8505 for a free 15-minute consultation. So, do you need a CSS platform, or would a CRM solution that includes customer service work better for you? The choice is ultimately one of business strategy. While a CRM system can put sales, marketing and service departments all on the same page, service departments can be more effective and efficient with a focused CSS solution. The only hard and fast rule is that the decision should be carefully weighed and considered. To learn more about how businesses have handled this decision, read about how three different companies addressed their own customer service challenges with online self-service software. Or, follow this link to start browsing customer service software solutions, including reviews, ratings and more.